Everyone old enough to remember the Rubik’s Cube craze of the 1980s in the USA also remembers how it was near impossible to solve the thing! 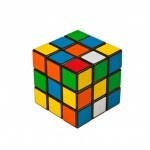 Originally created by a professor of architecture Erno Rubik, it was sold to a toy company in 1980 as the “Magic Cube”. To date, over 350 million cubes have been sold worldwide, making it the world’s top selling puzzle game, and most people think of it as the best-selling toy of all time as well. The original goal of creating this object was to help teach his students how to create something that rotated independently in layers without falling apart. Rubik didn’t realize he had created a puzzle until he scrambled it, and it took him over a month to solve it the first time! So what do you do with this thing? How DO you solve it? Download the official solver’s guide here. Or you can build a LEGO machine like JP Brown did to solve it for you! There’s also a World Cube Association where folks keep track of cube competitions and records. The fastest cube solve was set by Mats Valk in 2013 – he can solve it in under 6 seconds. Some of the more creative competitions include solving the cube while blindfolded (record is 23.8 seconds), with only one hand (record is 12.6 seconds), only using the feet (record is 27.93 seconds), and underwater using a single breath. LOVE the way you do that. I’m still working on mine. WOW !!!!!! !THAT IS AMAZING , DID YOU BUILD THAT ??????? ?